What Is VA Form 10-3542? VA Form 10-3542, Veteran/Beneficiary Claim for Reimbursement of Travel Expenses is a document submitted to the Department of Veterans Affairs (VA) by the veteran or beneficiary to cover trip expenses for getting professional medical help in another state or country. 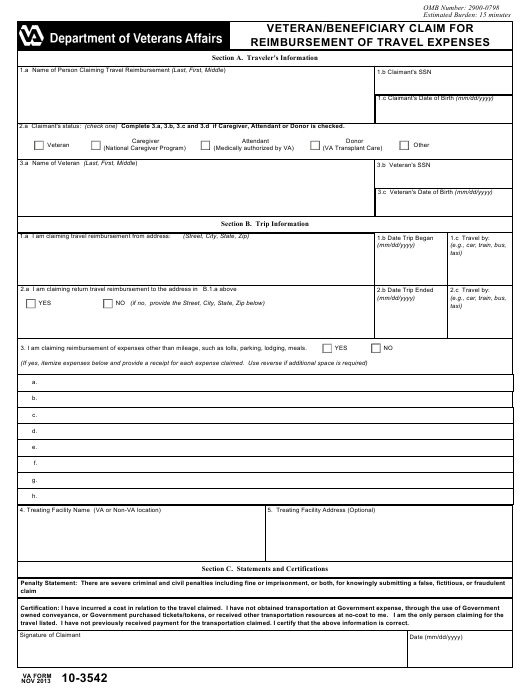 The latest version of the form was released by the VA in November 2013 with all previous editions obsolete. An up-to-date VA Form 10-3542 fillable version is available for download below and can be found through the VA website. If you are a veteran or beneficiary receiving a VA pension or if your income is lower than the pension, you are entitled to a travel compensation. The purpose of the travel eligible for reimbursement must be linked to your condition, treatment or service. Costs are reimbursed within thirty days after the travel. Certain non-veterans (caregivers to veterans under the National Caregivers Program, medically required attendants, VA transplant care donor and support person, or other claimants subject to current regulatory guidelines). How To Fill Out Va Form 10-3542? Where Do I Send My Va Form 10-3542? Where To Fax Va Form 10-3542? 2.a Claimant's status: (check one) Complete 3.a, 3.b, 3.c and 3.d if Caregiver, Attendant or Donor is checked. 3. I am claiming reimbursement of expenses other than mileage, such as tolls, parking, lodging, meals. travel listed. I have not previously received payment for the transportation claimed. I certify that the above information is correct. 1. The claimant or legal representative of claimant may complete this form. 3. The form may be presented in person or mailed to VA health care facility where care was provided. travel benefits may also be done in person at a VA health care facility. beyond 30 days may occur when claim is a result of change in Beneficiary Travel eligibility. is required for meals and lodging. claim will be processed for payment at currently authorized rate subject to any required deductibles. 7. Payment will be by electronic funds transfer (EFT) unless other arrangements have been made. and for VA to determine the individual's eligibility for the benefit. The form is completed by a veteran-claimant or their representative. Allied beneficiaries and beneficiaries of other federal agencies do not have to complete Section A, Question 3a-c regarding the veteran's full name, social security number, and date of birth. Receipts are required for the following expenses: non-mileage expenses, including bridge, road and tunnel tolls, as well as parking, ferry fares, meals and lodging, transport by bus, train, taxi or other public transportation. Meals and lodging require prior approval. The claim will be evaluated to determine eligibility for travel benefits and services. If it is determined eligible, it will be processed for payment at a currently authorized rate subject to any required deductibles. The VA Form 10-3542 is distributed with filling guidelines provided in the second page of the form. Step-by-step instructions can be found below. Section C is for the certification. The claimant states that they have provided true-to-life and up-to-date information and have incurred a cost in relation to the travel claimed; has not obtained transportation at government expense, through the use of government-owned conveyance, or government purchased tickets or tokens or received other transportation resources at no cost to them. Also, the claimant has to certify that they have never received any veteran trip compensation before, and they are the only person claiming for the travel listed. When signing the form the claimant must be aware of their full responsibility for the provided data. Providing false, fictitious, or fraudulent details leads to severe criminal and civil penalties including fine or imprisonment, or both. The form may be presented in person or mailed to the VA health care facility where this care was provided. An up-to-date VA facility locator tool allows an individual to search for the nearest VA medical center, as well as other health facilities, benefits offices, cemeteries, and Vet Centers within 1925 VA facilities. This storehouse of facility and key staff information within VA facilities is maintained on a regular basis throughout the VA network, is designed for ease-of-use and categorizes information for browsing by state and administration. The addresses of all VA health care facilities can be found on the VA website. One of the methods to apply for travel reimbursement is to send the VA travel form 10-3542 via secure fax or mail to the local Beneficiary Travel Office. Contact information, including phone numbers and fax numbers of VA health care facilities, can be found at the VA website.